Block Universe, London’s international performance art festival, is now in its third year running. For one week, a truly cosmopolitan line-up of contemporary, multimedia art was presented across London’s diverse institutions and venues. The programme included five newly commissioned and site-specific performances, four UK premieres, exclusive artist talks, and workshops. This year’s theme interrogated the notions of nationhood, inclusivity and identity within a rapidly changing socio-political landscape. Performance Reviewed was kindly invited to check out the festival this year, which ran from Monday 29th May to Sunday 4th June. Unfortunately, due to outside circumstances, I was only able to attend three of them. Nevertheless, for me, each was a fascinating entree into the world of performance art. Stina Nyberg opened the festival performances with the premiere of Shapes of States. In the secluded Tabernacle, Notting Hill, Nyberg’s piece examined the history of public health in her native Sweden. Based upon Meyerhold’s Biomechanics and Taylorism, the cast enacts a series of precise, synthetic movements and patterns. Through these tableaus, they tell a disquieting story about our modern dream for disciplining the body. This intriguing piece was somewhat marred by a lack of audio equipment for the accompanying verbal description. Fortunately, Nyberg’s arresting choreography – performed with great fortitude and meticulousness by the cast – hardly required any description. 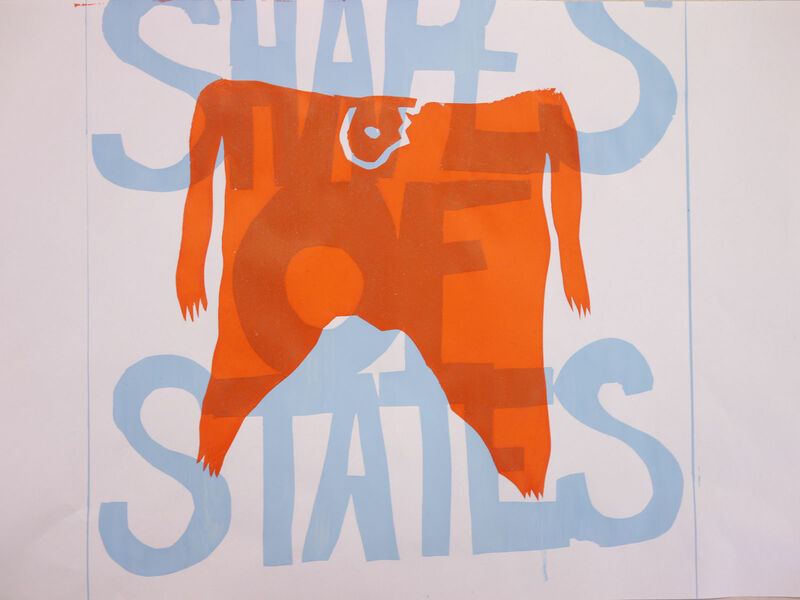 Combined with a simple, striking set design, Shapes of States was a bold, if sometimes uncomfortable, vision to behold. 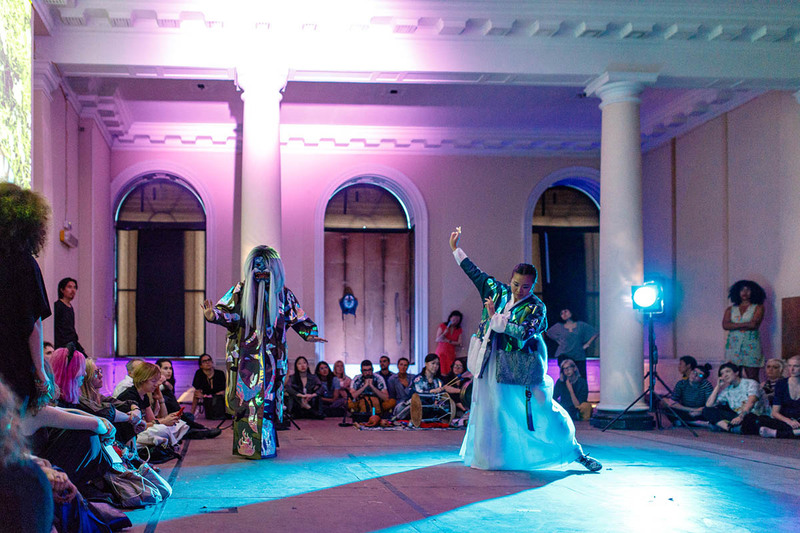 My favourite performance of the festival was Zadie Xa’s Crash, Boom, Hisssssss. Legend of the Liquid Sword. In the lofty Lancaster Rooms at Somerset House, the audience was immersed in a fantastical, multi-sensory realm. Ostensibly this is an example of Pansori, traditional Korean genre of musical storytelling. Through rhythmic dance, oral narration and visual projections, Xa tells a fable about a Manshin’s (shaman) spiritual journey. Yet a rather more contemporary framework – Western, millenial hip-hop – soon emerges. Through this weird syncrestism, we see the artist’s struggle to reconcile her Korean-Canadian heritage – and whether she can be truly ‘authentic’ to either. A very cool production, and a very fun experience. The final performance of the festival was Choreography for a Running Male by Egle Budvytyte. Free to the public -for reasons which are soon obvious – this Starting at St Leonards Church, bounding Shoreditch and Hackney, a group of men traced a path through suburbs, between back-alleys, and across the greens. Their slow and mechanical march, only occasionally paused to enact strange routines, eerily recalls totalitarian disciplines for bodily control – individual and social. Alone the men might have been merely eccentric, but in a group they caused a cascading effect of social disquiet. Certainly the multifarious reactions of the public was fascinating enough in itself. Above all, Block Universe 2017 demonstrated to me how good curation can make a festival of this kind. Individually the performances were visually bold and intellectually challenging. They were also enjoyable experiences in of themselves. All three were commissioned from/created by international artists; and they offered diverse insights into the very much globalised challenges of today. Despite my initial reservations about performance art in general, I’m very glad for the opportunity to have seen these works. The festival was also a week-long tour of (central) London itself – from the avenues of Notting Hill to those of Hackney, and all of the Embankment between. Each day I saw one of London’s different faces – beautiful and serene, grand and imposing, trendy and hustling. Even the venues, from a renovated Victorian church, to the streets of an entire borough, felt unique. For me, this was as much a celebration of the diverse places we find ourselves living, and playing, in as it was about the performances. If you have any level of interest (or curiosity) at all in performance art, this is the occasion for it. Many thanks to Block Universe, and I very much look forward to what 2018’s incarnation has in store!